At Dufferin-Steeles Animal Hospital, all of our patients and clients are treated with respect. We offer high quality medicine, surgery and patient care. Our philosophy encourages owners to be actively involved in their pets’ medical care. We place a strong emphasis on preventative medicine in order to provide our patients with the best quality of life. Dufferin-Steeles Animal Hospital provides a wide range of services, including comprehensive veterinary care, general and speciality surgeries, immunizations, digital X-ray and ultrasound services, therapeutic diets, dental care, pharmacy services, grooming, and “bed and breakfast” facilities (a.k.a. boarding). The DSAH team includes a veterinarian, a registered veterinary technician and front office staff with many years of caring veterinary experience. At Dufferin-Steeles Animal Hospital we recommend that all pets undergo a complete wellness exam at least once a year. We believe that your pet is healthier when you know more about his or her health care plan. Exams are a great time to share information with you about your pet’s health. We may ask you questions about your pet’s diet and lifestyle and we encourage you to ask any questions you may have about your pet’s health. Regular examinations keep your pet healthy. Most importantly, a complete “nose-to-tail” examination allows us to develop a comprehensive health profile for your pet. This information aids us in future treatment of your pet and helps us identify medical problems at an early stage, before they develop into serious conditions that are difficult and expensive to treat. During an exam, we discuss vaccinations, nutrition, behavior and other topics that are important for maintaining the health and well-being of your pet. ​At Dufferin-Steeles Animal Hospital, we place a strong emphasis on preventive medicine in order to provide our patients with the best quality of life. Vaccines are the cornerstone of your pet’s preventive health care plan. At Dufferin-Steeles Animal Hospital, we vaccinate your pet based on his or her unique individual needs and lifestyle. However, we recommend all pets receive vaccinations against leptospirosis, parvovirus, and distemper, due to the large population of raccoons in the city. We also offer three-years rabies vaccinations for our dogs and cats. Thanks to advances in veterinary medicine, many common diseases once fatal to pets are now prevented through the use of vaccinations. Keeping your pet free of parasites (fleas, ticks, hookworms, etc.) is essential to his or her health. Parasites can also affect you and your family. Parasites such as roundworms and hookworms are zoonotic, which means they can be transferred to humans. Our parasite prevention program protects your pet against ticks, heartworm infection, intestinal parasites, fleas and other common pet parasites. Every year, thousands of pets go missing and sadly, only about 17% of lost dogs and 2% of lost cats ever find their way back from shelters to their original owners. Collars and I.D. tags are a good start at ensuring your pet can be returned to you, but they are not one hundred percent dependable. Tags can fade, rust or get scratched and be impossible to read. Collars can tear or slip off. With microchipping, a tiny chip - about the size of a grain of rice - is placed just under your pet's skin, between the shoulder blades. The number on the chip is then entered in a database that is accessible by any animal hospital, shelter or humane society. The chip can't be lost or damaged and it lasts for the pet's lifetime. A microchip is convenient, safe and reliable and it gives your pet a fighting chance to find his/her way back home. Advanced digital radiology is one of the most effective tools available when diagnosing your pet’s condition. Dufferin-Steeles Animal Hospital is proud to offer digital radiology for your pet. X-rays are a powerful, versatile diagnostic tool. X-rays are used to identify the location and severity of fractures, detect signs of heart disease, and identify foreign bodies in your pet’s stomach and much more. Digital x-ray technology greatly benefits your pet. Digital x-ray equipment produces high-quality, accurate images. This results in fast, more accurate treatment for your pet. These images can also be saved to a disc or emailed to a specialist, allowing for fast consultations and specialty care, when necessary. Ultrasound is a valuable, non-invasive imaging procedure that complements x-rays and allows our veterinarian to better visualize internal organs in the chest and abdomen. During an ultrasound, high-frequency sound waves are directed into the body and bounce off the organs, creating a computer image of the inside of the body. This painless diagnostic technique is normally done without sedation of your pet. Ultrasound works best in conjunction with other diagnostic procedures. For example, if an x-ray detects a lesion, an ultrasound can determine the origin of the lesion and whether it has spread elsewhere in your pet’s body. Your pet’s safety and comfort are our highest priority at Dufferin- Steeles Animal Hospital. Whether your pet needs a routine spay or neuter procedure or requires a more complicated soft-tissue surgery, the team at Dufferin-Steeles Animal Hospital are ready to provide compassionate care using advanced veterinary surgical techniques. Prior to surgery, your pet undergoes a full physical examination and pre-anesthetic blood testing. We use the examination and blood test results to develop an anesthetic protocol for your pet. During surgery, your pet’s vital signs, including blood pressure, oxygen levels, and heart rate, are monitored using advanced monitoring equipment. As well your pet is placed on intravenous fluids which allows for a safer procedure. A trained veterinary technician is on hand to monitor your pet’s condition during surgery. It is our goal to make your pet comfortable and provide you with peace of mind. We encourage you to ask questions about your pet’s surgery and welcome you to call and check on your pet following surgery. We perform a thorough physical exam and blood tests on your pet before the professional anesthetic dental cleaning to ensure that your pet is healthy enough for this procedure. These tests also help us develop an individualized anesthetic protocol that is specific for your pet. Once anesthesia is administered, the cleaning begins. We use modern and safe ultrasonic equipment to clean each tooth thoroughly, both above and below the gum line. Our specially trained dental technicians polish your pet’s teeth, which creates a smooth, lustrous surface that is more resistant to plaque build-up. Finally, a fluoride treatment is used to help strengthen the enamel and reduce tooth sensitivity. Your pet’s dental care doesn’t end after he or she leaves the hospital. Our staff can show you how to brush your pet’s teeth at home. This is an excellent way to prevent plaque and tartar build-up and promote good oral hygiene. Plaque and tartar build-up on your pet’s teeth can lead to gingivitis. Reddened, bleeding gums, difficulty chewing and bad breath are all signs of gingivitis. 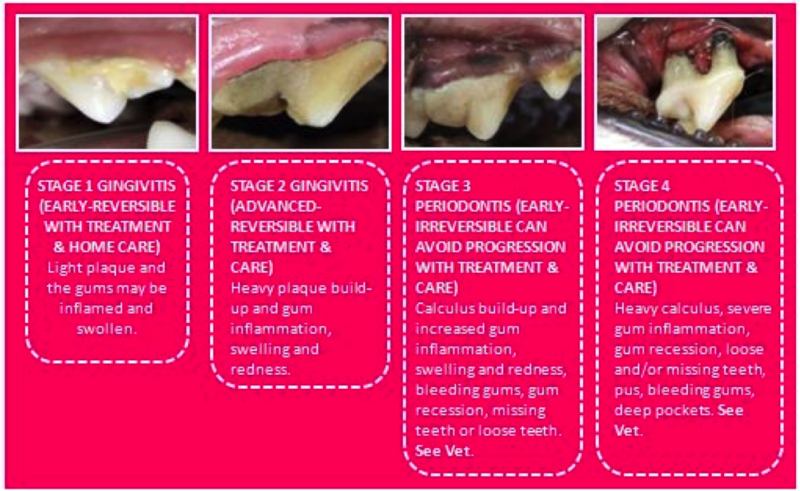 Untreated gingivitis can progress to a more advanced form of periodontal disease, a bacterial infection that, if left untreated, can cause the loss of teeth. The same bacteria causing gingivitis and periodontal disease can be carried into the blood stream and cause damage to your pet’s kidneys, heart, liver and other organs. Regular dental cleanings remove plaque and tartar and prevent gingivitis and periodontal disease.